Kids will love zipping down the water slide and playing water basketball. Drift down a river of cooling paradise. 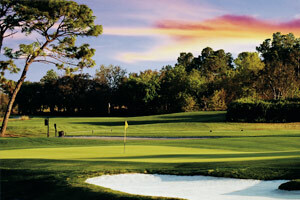 Omni Resort at Championsgate is home to a renowned golf academy. Residences here feature elegant living and dining rooms. It's not your ordinary breakfast buffet, with an omelet station, grits bar, and lots more. Head to Mokara Salon & Spa for a delicate massage and facial. You get complimentary shuttle access to all Disney theme parks. The resort is home to the David Leadbetter Golf Academy and Champions 9 Golf Course. Float through a jungle, lined with lounge chairs, and ending at a palace-like pool bar. Any kids or kids-at-heart will go wild for the 125-foot corkscrew waterslide, and the lazy river flanked with water cannons. Grab a drink at Croc's and relax by the pool. Eat breakfast outside. There's a terrace with every unit. Omni Orlando Resort at ChampionsGate is a family-friendly, 4.5-star luxurious golf resort in Orlando. One of the biggest highlights is access to the renowned Leadbetter Golf Academy. There are thirty-six holes of championship golf (designed by Greg Norman) and a lighted nine-hole course. Once you get settled In your condo, get everyone changed into swimsuits and apply sunscreen before heading to the fifteen-acre pool area. It includes a zero-entry family pool with a one-hundred and twenty-five-foot waterslide, an adult pool, and Orlando's only resort wave pool. But wait, there’s more: an eight-hundred and fifty-foot lazy river with water cannons and a waterfall. Rent a cabana and lounge with a refreshing cocktail from the pool bar and grill. Feel like getting your cardio on? Omni Orlando’s Full-Service Fitness Center is open 24/7, so it’s ready when you are. Treat yourself to a massage or body treatment at the European-Style Mokara Spa while the kids hang out at the arcade. The resort offers daily family activities, and during the weekends there is a kid’s program that the little ones will love. Two- to three-bedroom condos sleep six to eight guests and have enough space for the kids and their toys, blankets and games. Full kitchens with granite countertops have everything that you need to whip up anything from Kraft Macaroni & Cheese to Thanksgiving dinner. (If you don’t feel like cooking, no problem! There are four unique restaurants on-site to choose from). Surprise the kids with top-your-own pizza night and let them go wild. Declare the pizza with the most unusual toppings the winner and put the pizza artist in charge of picking the movie for family movie night thanks to your Flatscreen TV with DVD player. Show off your multitasking skills and do a load of laundry in your in-suite washer/dryer while the movie is playing. Take advantage of Omni Orlando Resort at ChampionsGate’s complimentary shuttle service to Walt Disney World®. Visit the concierge to book your reservation (24-hours notice required). Walt Disney World® consists of theme parks. Magic Kingdom® is home to classic attractions Pirates of the Caribbean®, Country Bear Jamboree® and the Haunted Mansion®. Visit Epcot’s® World Showcase® where you can experience the culture and food of eleven countries around the world. Muppet*Vision 3D, Fantasmic! And Beauty and the Beast Live on Stage can be found at Hollywood Studios®. Pandora – The World of Avatar® is at Animal Kingdom®. Ride Avatar Flight of Passage, explore the world of Pandora like never before on Valley of Mo’ora and experience Na’vi River Journey. SeaWorld® has animal shows, rides and animal experiences. See Dolphin Days, Ocean Discovery and Ignite. Ride Kraken Unleashed, Manta, and Antarctica: Empire of the Penguin. Animal experiences include penguins and dolphins. Universal Orlando® is made up of two theme parks: Universal Studios® and Universal’s Islands of Adventure®. With rides based on Jurassic Park, E.T., Spider-Man, King Kong and many more. Fans of J.K. Rowling’s Harry Potter series will definitely want to visit The Wizarding World of Harry Potter®, located over both theme parks.